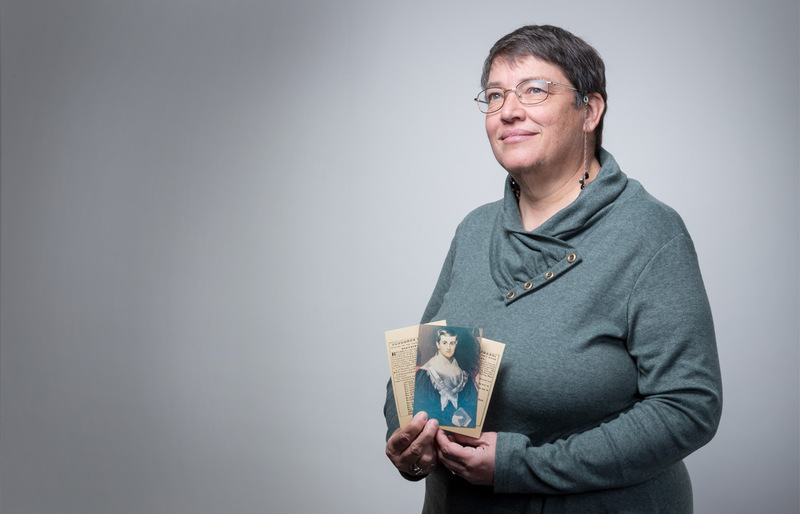 Department of Humanities Professor Jennifer Rycenga’s expansive research interests include religion, politics, popular and classical music and lesbian history. An alumna of UC Berkeley and the Graduate Theologian Union, she has taught at SJSU for more than 20 years and coordinates the Comparative Religious Studies Program. Co-editor of The Mary Daly Reader (NYU Press, 2017), Queering the Popular Pitch (Routledge, 2006) and Frontline Feminisms: Women, War and Resistance (Routledge, 2001), she is currently working on a cultural biography of white abolitionist educator Prudence Crandall (1803-1890). She talked with WSQ about her Crandall project, research methods and the joys of birding. WSQ: Tell us about the subject of your research. Prudence Crandall had an Academy for women in Canterbury, Connecticut, in 1831. In 1832, three extraordinary events occurred. First, Crandall was reading the then-little-known abolitionist newspaper from Boston, The Liberator, supplied to her by a household employee of hers, a young black woman named Maria Davis. The Liberator issues contained the second extraordinary occurrence: writings from black men and women, most notably the first American woman to give public political speeches, black Bostonian widow Maria Stewart. Stewart called for the establishment of a high school for black women, and encouraged education as the path to equality. The third extraordinary event occurred in the fall of 1832. Maria Davis’s future sister-in-law, Sarah Harris, asked Crandall if she could attend the Academy. Crandall agreed, and all went smoothly for a time. But the white parents of the students were not pleased with this change in the school. They threatened and cajoled Crandall to drop Harris from the roster; she refused. Instead, Crandall went to Boston, visiting with the editor of The Liberator, William Lloyd Garrison, to discuss her plan to reopen the school for black women only. Garrison pledged his support. WSQ: And did Crandall reopen her school? Yes. The new Academy was publicized with an advertisement featuring seven white and eight black male endorsers—one of the most racially integrated documents in the history of the abolitionist movement. Over the next 18 months, Crandall and her co-teachers maintained the school, and more than two dozen black women studied there. The townspeople of Canterbury opposed the Academy with persistent racist tactics, including cow patties thrown into the well water and the butchery of a black-and-white cat to mark the villagers’ opposition to racial integration. The leader of the opposition, Andrew Judson, had a law passed in the Connecticut Assembly, making the harboring of out-of-state blacks for purposes of education illegal in Connecticut. This led to extensive litigation against the school. Yet despite these assaults, the school continued until a vicious attack in September 1834 left the school building uninhabitable. My research has been able to demonstrate that, despite such opposition, the students went on to achieve places of importance in the free black community, affecting the movements for change that led up to and past the Civil War. The rock that Crandall threw into the complacency of white society in the north resulted in many generations of black self-determination and a richer sense of who we can be as a country. WSQ: When did you first become interested in Crandall? I first learned of Crandall in the late 1990s, ancillary to my research on the black abolitionist Maria Stewart. My mother and I love to travel to historic places, so when I read about the Crandall Academy, now housing a museum, we included it on a trip in southern New England. That was in 1997! I was hooked as soon as I learned the trajectory of Crandall’s life. What I have discovered, though, turns out to be infinitely richer than I could have conceived when I began. Crandall’s school represented one of the strongest early coalitions across lines of difference in American history. Black women, black men, white women and white men not only worked together to launch and maintain the Academy in Canterbury, Connecticut, but they understood the need to protect each other. For instance, the names of the students were not revealed by the abolitionist press nor by Crandall herself. This creates some headaches for historians, but it demonstrates a perceptive incipient analysis of privilege and risk. Crandall’s legal team (who, of course, were white men) built an insightful argument for both black citizenship and female citizenship; their arguments would reappear in the Dred Scott case and Brown-v-Board. Part of what I have discovered is the existence of an American anti-racist genealogy. To be anti-racist means that you embrace the equality of all people, and do not seek to blame the victims of prejudice for the prejudice directed against them. Crandall grasped that the problems created by racism were in no way the fault of black people. WSQ: There seem to be several layers of discrimination operating in this higher education story. One of the most important aspects of this story is how we can witness intersecting identities. The black students were facing prejudice primarily because of race, but also by virtue of their gender, age, sexuality, class status and class strivings. Crandall was dismissed by some opponents, then and now, because she was merely a woman. The Academy in Canterbury offered a unique opportunity for black families to give their daughters not only an advanced education, but the skills necessary to extend education more broadly through the black community, by training them to become teachers, too. I think of this when I interact with the many future teachers of California who come through the liberal studies program in our humanities department. Their wonderful diversity, across race, language, gender, sexuality and religion, shows me that the legacy of Crandall, Harris, and the other students lives on in America. WSQ: Did Crandall’s religion influence her academic mission? Definitely. She was raised Quaker, and so the egalitarian ideals of that denomination were part of her deepest core. She also benefitted from the superior educational opportunities that the Quakers offered to women: she had attended a Quaker boarding school whose curriculum closely mirrored that of her own academy. However, Crandall left the Quakers and joined the Baptists in 1831. The Baptists were more open to the optimism of the Second Great Awakening and the evangelical tendency that maintained that reforming society was a way of manifesting one’s faith. Crandall used the Bible talismanically when Sarah Harris asked to join the school. She opened to Ecclesiastes 4:1, which speaks to the oppressed lacking advocates. She took this as a divine mandate to admit Harris and, later, the other black students. WSQ: What draws you to historical research? What about the process do you find most satisfying as a scholar? To be able to rescue some names and lives from obscurity, to remember the warp and woof of how they lived out what it means to be human. History is the place where the big ideas of what is meaningful meet up with the details of life as it is experienced. In the case of those involved in the Canterbury Academy, I found that by examining women’s lives and interracial cooperation, I have discerned how the participants were expanding the boundaries of what was possible for women to do and be. WSQ: You’ve been teaching at SJSU since 1995. As someone keyed into cultural and academic shifts, describe some of the differences in your classroom and students then and now. I think that in the 1990s, students still had fairly standard expectations of what to expect from college, in terms of curriculum and fields of study. With the geometric growth of the internet, both students and professors are in a perpetual candy shop of information, ideas, and opinions. On the one hand, research skills have improved. Students are easily able to locate scholarly articles and build extensive bibliographies. On the other hand, the internet inculcates lazy habits, such as stopping too early in a search and not knowing how to discern the quality of a source. Today’s students have easier access to knowledge, but a more difficult road to discover wisdom. That’s not a bad thing, really. By flooding students with information and opinions, the Internet forces them to learn how to swim intellectually! WSQ: You’re also an avid birder. Which bird “encounters” are currently on your wish list? Any bird, through its behavior or unexpected appearance, can be a delight. I’ve maintained a list of all the species I’ve seen on the campus over the last 22 years and have now seen 64 species in our three-by-six block downtown oasis. The most recent addition was among the most welcome: families of Western Bluebird that I saw hawking insects off Tower Lawn in July 2017. I have now branched out, so to say, to an interest in all taxa and have been recording my sightings of insects, mammals, lichens and more in the stupendous online platform, iNaturalist. I urge WSQ readers to contribute their sightings to the project I’ve started on San Jose State Biodiversity: inaturalist.org/projects/san-jose-state-biodiversity. The platform is free to all (and open-source, too, for computer geeks), and works easily with your phone’s camera through the iNaturalist app. In fact, I regularly call iNaturalist “the smartest use of a smart phone” because it gives each of us the ability to document and learn about the world around us.